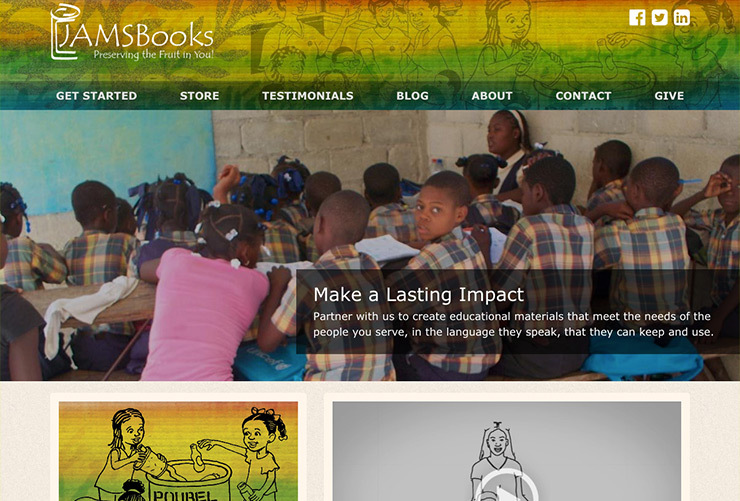 JAMSBooks is a local small business that is having a major impact around the world. It is a custom illustration, design and printing group integrates a combined 30 years of marketing, creative design and medical mission experience to create customized educational materials for people who are in most need internationally. Initially, I was tasked with adding eCommerce to JAMSBooks existing site. However, after a conversation about their business, it became clear their site really didn’t match their core business: creating custom culturally sensitive educational media for people who need it most. I redesigned and developed their website with a focus on informing visitors about their exciting service with the goal of JAMSBooks being hired for more projects. One of the most significant things we did with this site is to create an explainer video to walk potential clients through what JAMSBooks offers. After many edits to the draft and working with the video creator on revisions, we arrived at a finished product. I’ve since learned how to create my own explainer videos; however, when custom art is needed, I still outsource.